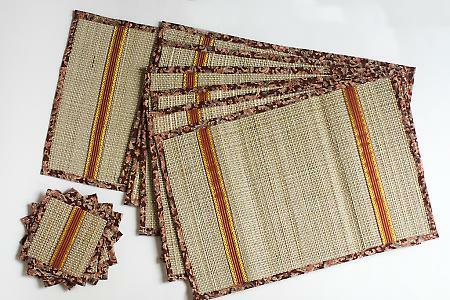 Mats made with kora / sedge grass are extremely delicate and highly valued. Kora grass is found in abundance along the banks of the rivers and in marshy areas in Tamil Nadu and Kerala. The process of creating the mat is painstaking and time consuming. The grass which grows to a height of 3-4 feet is green in colour. The grass is harvested in the months of September/ October and February/March and is cut very finely while it is still green. The outer part of the stem is used for weaving while the inside of the stem is removed with a sharp-edged knife. The strips of grass are then dried in the hot sun and care is taken not to expose the grass to humidity, as they tend to turn black with the exposure. As the dried grass strips turn a yellowish green colour they are boiled in a pot of water and then dried again. The dried grass is made up into bundles and then soaked in running water so that the grass remains just below the surface of the water for three to seven days which causes the grass to swell up to three times its original size. After it is then dried again in the sun the slow process of weaving commences on a floor loom. Once the weaving is complete, the mat is dried in the sun for a short while after which it is polished. With the introduction of chemical dyes a wide hue of colours are now being incorporated into mat making which otherwise used red and black colours. The mats which are extremely reliable and can be easily folded include the 5 x 3 feet sleeping mat, prayer mats, table mats and panthi mats which are used to sit on while eating.